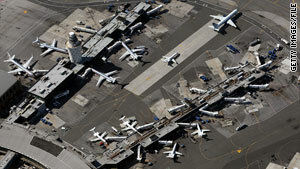 The US Airways Express flight departed from New York's LaGuardia Airport, above. (CNN) -- An Orthodox Jewish man apparently preparing to pray prompted authorities to divert a Louisville, Kentucky-bound US Airways Express plane Thursday. FBI spokesman J.J. Klaver said there appeared to be no threat from the man, who was described as wearing something on his head that included leather pieces. The description appeared to match that of tefillin, or phylacteries, which Orthodox Jewish men wear during prayer. The flight had taken off from New York's LaGuardia Airport, the FBI said, and was diverted to Philadelphia, Pennsylvania. The Transportation Security Administration said it was notified of what it called a disruptive passenger on Flight 3079, operated by Chautauqua Airlines, around 8:30 a.m. ET, and the plane landed without incident at Philadelphia International Airport about 20 minutes later. US Airways spokesman Morgan Durrant said the diversion was a "security precaution" for the 50-seat ERJ 145. It was not immediately clear how many passengers were on board. Earlier, Durrant said the flight had been evacuated, but the TSA did not offer any details on whether that had occurred. TSA and law enforcement officials met the flight, interviewed the passenger and did a security sweep of the plane without finding anything of concern, the agency said. CNN's Evan Buxbaum contributed to this report.